Susan S. Fainstein is a Senior Research Fellow in the Harvard Graduate School of Design; she joined the faculty in 2006 as a professor of urban planning and retired from teaching in 2012. Her book The Just City was published in 2010 by Cornell University Press. Among her other books are The City Builders: Property, Politics, and Planning in London and New York; Restructuring the City; and Urban Political Movements. 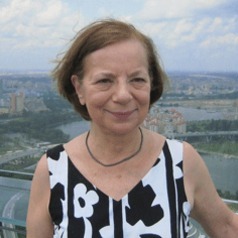 She has co-edited volumes on urban tourism (The Tourist City and Cities and Visitors), planning theory (Readings in Planning Theory), urban theory (Readings in Urban Theory), and gender (Gender and Planning) and has authored over 100 book chapters and articles in scholarly journals. Her research interests include planning theory, urban theory, urban redevelopment, and comparative urban policy focusing on the United States, Europe, and East Asia. She received the Distinguished Educator Award of the Association of American Schools of Planning (ACSP), which recognizes lifetime career achievement, the Davidoff Book Award of the ACSP, and has been a resident fellow at the Rockefeller Foundation Center for Scholars at Bellagio. Professor Fainstein has been a professor of planning in the Graduate School of Architecture, Planning and Preservation at Columbia University and of planning at Rutgers University. She has held the Wibaut Chair for Distinguished International Visitors at the University of Amsterdam and visiting appointments at the University of the Witwatersrand, SA, the University of London, Cleveland State University, New York University, Queens University (Canada), the University of British Columbia, and the Lee Kuan Yew School of the National University of Singapore. She has served on numerous editorial boards, was an editor of the International Journal of Urban and Regional Research and of Ethnic and Racial Studies, and has served as a consultant to various public organizations. She received her A.B. from Harvard University in government, her M.A. from Boston University in African Studies, and her Ph.D. in political science from MIT.